Well, the challenge is where to stop! 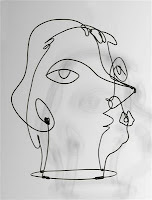 I was delighted by his wire sculptures and this tempted me into making a wire sketch of my eldest son. I confess, I don't feel at all comfortable working with wire, but I sketched a rough plan of a brooch, adding characteristic "Calder" spirals. Having picked up my favourite pliers and a length of 1mm wire I was surprised how quickly it came together. I really enjoyed the spontaneity of the piece. After adding a hand forged steel brooch pin and tumbling it for hours and hours to harden the silver, this is my sketch pin. I hope I've captured a little of him, even if it's only his tumble of curls. 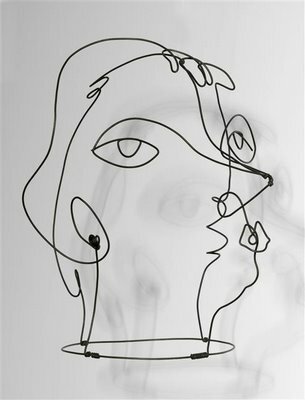 Find more Calder inspired work on the etsymetal blog.